A bright, cheerful and fast-paced comedy, Back To The Future elevated Michael J. Fox into movie stardom, established Robert Zemeckis as an A-List director of thoughtful comedies, and spawned two sequels. The DeLorean time-travelling car, the Flux Capacitor, and the Doc Brown character have had a long-lasting and fondly-remembered impact on popular culture. 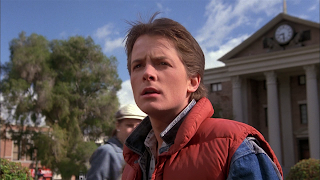 Marty McFly (Fox) is a teenager in the small town of Hill Valley, California, struggling to fit in and embarrassed by his parents. Marty's Dad George (Crispin Glover) is a meek nerd, easily pushed around and insulted by his boss Biff (Thomas Wilson). Marty's Mom Lorraine (Lea Thompson) is conservative and a nag. 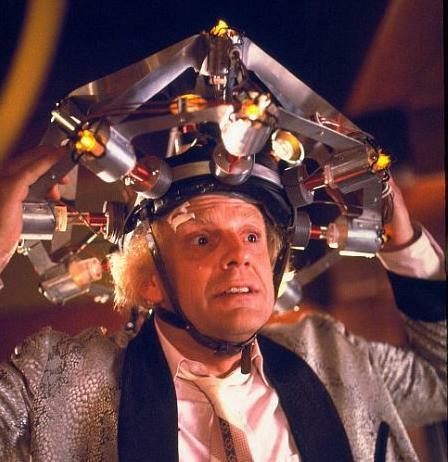 Marty's best friend is the local eccentric inventor Doc Brown (Christopher Lloyd). Brown has invented something called the Flux Capacitor, and used it to convert a DeLorean car into a time travel machine. Brown seeks Marty's help to record the maiden journey of the DeLorean, but angry Libyan terrorists show up at the wrong time and force Marty to take refuge in the car and zip back in time to 1955. It's the year that George and Lorraine met and fell in love. Marty's sudden appearance in Hill Valley of 1955 immediately causes a stir, and he disrupts the events that ignite George and Lorraine's high school romance. In fact, the young Lorraine immediately develops a crush on the cool Marty, ignoring the doofus George, who is already being continuously harassed by the bully Biff. Unless Marty can get his parents to fall in love, his existence will be erased. Marty also has to seek the help of a young Dr. Brown (although he looks pretty much the same in 1955 and 1985) to travel back to the future, taking advantage of an impeding lighting storm. Marty has a week to frantically find a way to make sure that his parents do indeed fall in love, and in the meantime he takes every opportunity to improve their personalities along the way. With Steven Spielberg as one of the Executive Producers, Back To The Future strikes the perfect balance between superior quality and self-depreciation. Director Robert Zemeckis directs with brisk pacing, making every scene count and sharply defining the key characters. While the film never aims for more than two dimensions, Fox ensures that Marty is eminently likable, and Lloyd makes Doc Brown, with his wild white hair and perpetually wide eyes, one of the more memorable mad scientists in movie history. Lea Thompson gets the least showy but most delicate role. The film handles the potentially precarious covetous relationship between the young Lorraine and her teen-aged son with a playfully steady hand, and steers it to an unexpected but in retrospect obvious resolution. The highlights are many, and include the DeLorean leaving flaming tire marks as it launches into time travel, Marty's skateboard antics, and his over-enthusiastic electric guitar shredding at the high school dance. Back To The Future's formula for success involves poking fun mostly at itself, and the film creates a rich environment with plenty of targets, and hits them all square on the funny bone.